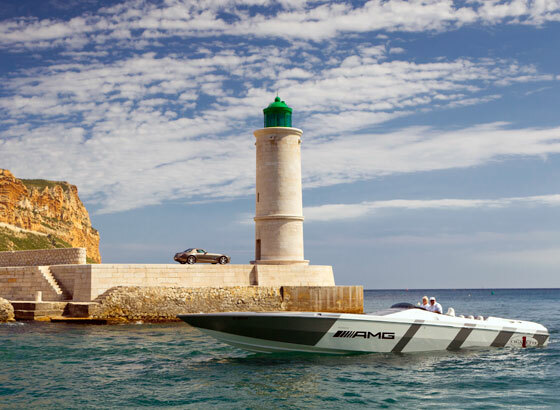 Straight talk with the owner/CEO of go-fast boating’s most iconic brand. 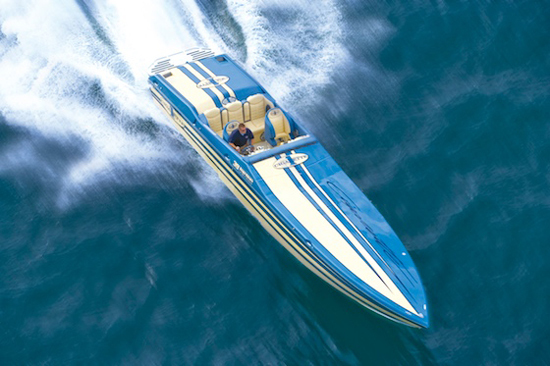 Based in Opa-Locka, Fla., Cigarette Racing Team, the world’s best-known builder of high-performance powerboats, doles out precious little information about what’s happening inside the company or what might be coming in any given year. 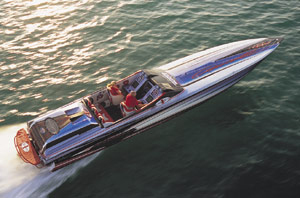 Leading Cigarette’s sportboat sales is the 50’ Marauder. That’s not an accident—it’s the no-exceptions imperative of Skip Braver, a former electronics sales representative and real estate developer, who bought the company 12 years ago. Instead, Braver prefers to have his company do major releases one or twice a year, most notably at the annual Miami International Boat Show. 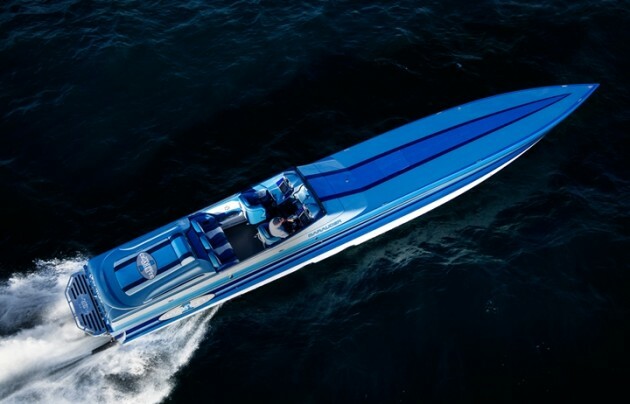 Cigarette doesn’t go big in Miami—it goes huge, as it did with this year’s release of its 50-foot Vision Gran Turismo concept boat alongside the concept car of the same name released by Mercedes AMG, Cigarette’s technology and marketing partner for several years. 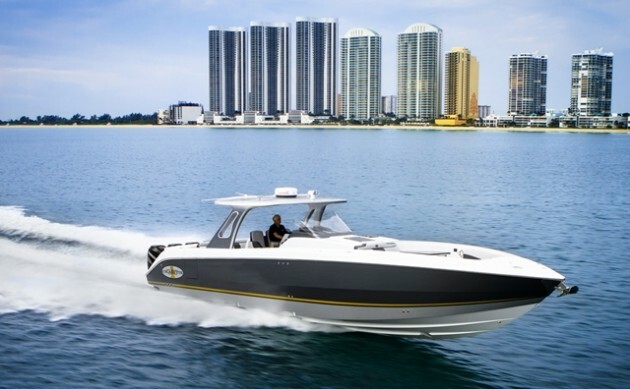 The year before in Miami, Cigarette unveiled its Electric Drive 38’ Top Gun V-bottom alongside Mercedes AMG’s Electric Drive SLS Coupe—both car and boat shared AMG technology. So it’s safe to say that when it comes to major releases, Cigarette has them wired. But between big debuts almost nothing about what’s happening inside the company’s wall leaks outside them. And the lack of any information regularly coming out of Cigarette Racing Team leads to endless speculation among those inside and outside the industry. Though Braver clearly wants Cigarette to fly below the radar when it suits his purpose—and no one could blame him for that—that’s a tall order for such an iconic company. And so the rumors start. 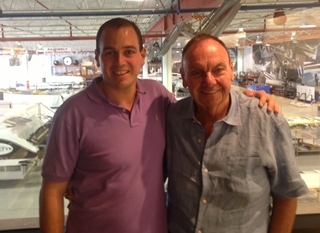 Braver (right) with Cigarette Racing Team’s Hector Rodriguez. Of course, those rumors eventually reach the ears of journalists. So on a recent trip to South Florida, I sat down with Braver in his office in what is the most upscale facility in the go-fast powerboat world to ask him four big questions about rumors that had reached me. What follows are the questions—and Braver’s answers to them. Is Cigarette eliminating its domestic dealer network? That is not the case. We are going to have people like Philly at Lip-Ship, Greg at Legend, and Greg at Pier 57 as distribution partners. David Woods and Marsha Floyd also are coming back to work with us to do what they do best, selling a luxury brand of V bottoms. This is a small, intimate business that has gotten even smaller. It’s a relationship business. Cigarette is not changing the market, the market is changing Cigarette. In 2002 when I bought the company, Cigarette had 22 dealers. Look at how many we have now. We have that many because the market has changed. We don’t ask our dealers to stock boats. A couple of them have demo boats for their own use, but there is no Cigarette inventory in the field. Every boat you see down there in production is sold. 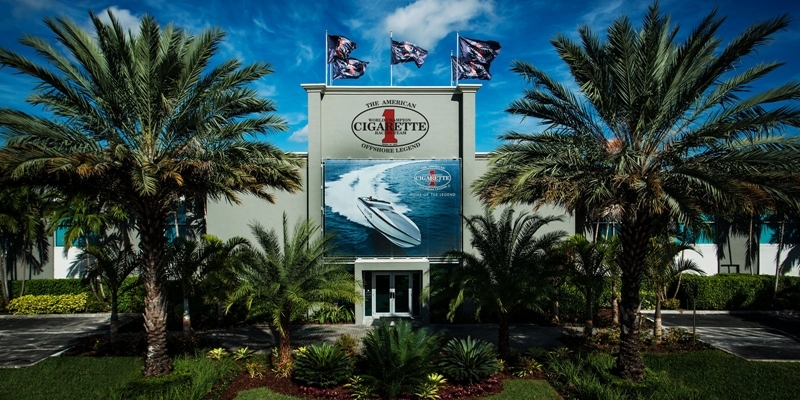 Cigarette Racing Team’s facility in Opa-Locka, Fla., is the most upscale production plant in the high-performance boating world. If we tell people we can build them a boat in 12 weeks, which we can, the rumor comes back that we must be ‘slow.’ We had to cut back during the recession to stay in business, but there was only one year—2008 or 2009—that we didn’t make money. Cigarette is a pretty hard brand to ‘tank,’ a pretty hard brand to screw up. Would Cigarette be where it is today if we hadn’t invested in projects like this factory and created our strategic partnerships? No. But could someone have bought it, built six boats a year and survived? Yeah. But we have money in the bank. We’re healthy. Does Cigarette’s relationship with Mercedes AMG provide tangible sales benefits for either company? Our relationship with Mercedes AMG has been more than satisfactory. It has sold boats for us. It has sold cars for them. Deals only work when they’re good for both parties. There’s a reason we have the strategic partnerships we have. 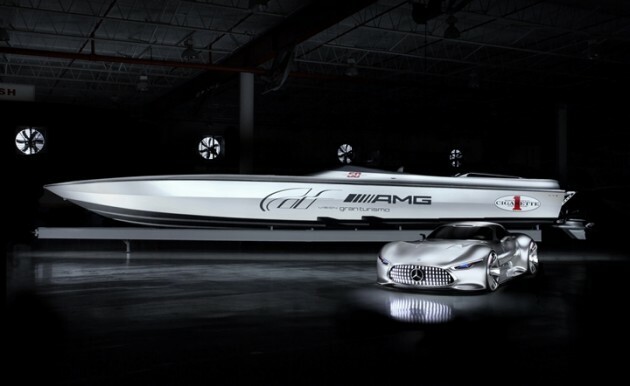 At the Miami Boat Show this year, you saw the head of design from Mercedes, the head of marketing from Mercedes AMG, and the director of GT Explorer Studio when we introduced the Vision Gran Turismo AMG concept car and 50’ Cigarette Vision Gran Turismo boat. They didn’t come here because they needed a good trip to Miami, they came because they understand it’s good for all of us. And as a consumer, I would want to know who a company is associated with—it gives me some assurance they’ll be around for while. 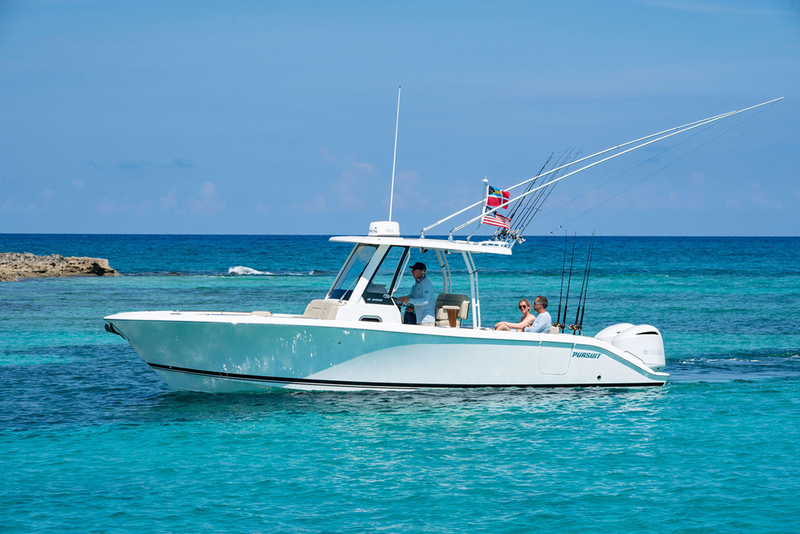 The five-outboard 42-foot Huntress is Cigarette’s best-selling center console. 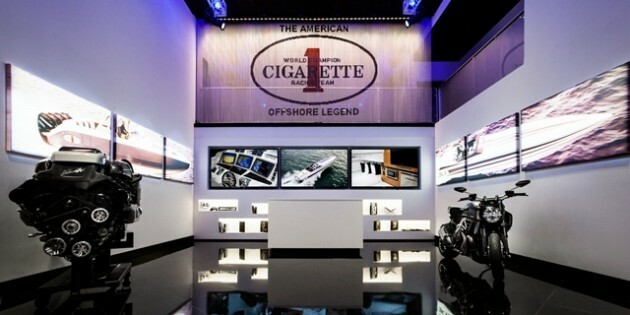 Is Cigarette moving away from its traditional go-fast boat customers? We are not abandoning our grassroots customers—that’s another misconception. We are still supporting certain poker runs and events. We still want to be out there with our clients. But I’ll tell you what I don’t want do. I don’t want to be out there fighting over the same 13 customers everybody else is fighting for. Cigarette is a real business, and we are looking to expand our business. And that’s a big part of the reason we have the partnership we do with Mercedes AMG. You can profit on your legacy, but you have to keep looking at your legacy. We didn’t ‘abandon’ the performance-boat segment— we sell more 50-foot V-bottoms than any other performance boat we make. And we also sell a five-outboard, 42-foot-long, 12-foot wide Huntress performance center-console. People are so shortsighted in this industry. We haven’t ‘abandoned’ anything.